The restaurant here offers British and Bermudian dishes. As you enter Swizzle Inn, there are thousands of business cards and graffiti pasted all over the walls. It's customary to leave your business card or scribble your name on the pub's colorful walls. The furniture in the pub have a rustic look. The guest book dates back from 1942. The Bermudian magazine rated the swizzleburger, a bacon cheese burger made at Swizzle Inn, as the best in Bermuda. Serving primarily pub fares, some of the freshly prepared favorites include fish & chips, conch fritters, shepherd's pie etc. These items are a notch above typical Bermudian pub grub. The Bailey's Bay Fish Sandwich and onion rings at Swizzle Inn are excellent and served during lunch time. The fish sandwich having a large portion is made of white toasts stuffed with battered local fish fillet, melted cheese, tartar sauce, lettuce and tomato. There are more varieties of food served during dinner though. You get the seafood medley (rockfish, mussels, and shrimp in marinara sauce), catch of the day, and some tasty Asian curries. Barbecues with ribs, steaks, and seafood are prepared on every Friday and Saturday. There are regular nighttime entertainment in the pub including live bands and trivia nights. There are special parties and celebrations held on St. Patrick’s Day and Thanksgiving Day. The on-site gift and souvenir shop Swagger Out Gift Shop is quite popular with both visitors and locals. You can also buy all these items through the pub's website. They accept credit cards. Reservations are not required and accepted only for a party of 8 or more. A sister restaurant, Swizzle Inn South Shore is now open in Warwick parish on the South Road and convenient for the visitors to the south shore beaches. Pub fares are priced between $9 to $17. 3 Blue Hole Hill, Bailey's Bay, Hamilton Parish. Bus Route: #1, 3, 10, 11 (operating between Hamilton City and St George). From dockyard take a ferry to Hamilton and then catch a bus. Check out Dining Map of Bermuda to see the location of Swizzle Inn and others nearby. 3) Check out Top Bermuda Restaurants to know about the best restaurants in Bermuda. 4) Visit Restaurants & Bars Directory for a complete list of dining choices in Bermuda. 5) Check out Hamilton Parish to know all about the place including the attractions, hotels, activities, maps and more. 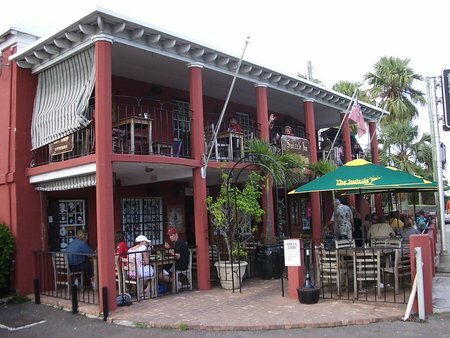 6) Check out Bermuda Nightlife for many other great pubs & bars.